Giovannetti Community Shelter in Urbandale, Iowa, is constructed with precast wall panels and hollow core roof plank, and has a Federal Emergency Management Agency-rated, 4,500-sq.-ft. safe room designed to withstand 250-mph wind forces and structural impacts. The project, however, had some difficulty coming to fruition. In fact, it first began as an ordinary park shelter among the 75-acre Walker Johnston Park—on a proposed budget that was half of what its community center program required. During a community focus group held by Des Moines-based ASK Studio, the project’s architect, it was suggested that a FEMA safe room be built within the shelter, allowing a majority of the costs to be covered by a FEMA federal grant, therefore allowing the building’s basic program remain unchanged. A Hazard Mitigation Grant Program – Safe Room Project Application was submitted to FEMA based on weather data from the National Climatic Data Center. Since 1958, there have been 50 recorded tornados in the Polk County area, including two F4 tornados. Data also showed that Urbandale experiences 20 severe thunderstorms with damaging winds and/or tornado activity per year. With federal grant secured, construction began in July 2012, precast erection following in December. To meet FEMA criteria, precast fabrication proceeded with above-normal detailing. Any opening greater than 3 inches required protection of some sort (steel plate, grating, reinforced windows). With the precast around the exterior having rigid insulation sandwiched between the panel, the penetration openings were designed to have enough concrete close to the opening for FEMA-rated windows and doors to anchor to—meeting FEMA’s guidelines—while maximizing the insulation to that opening to avoid cold spots in the precast. Insulated walls had 1-ft. total depth with dimensions at 4-in. exterior x 3-in. insulation x 5-in. interior. 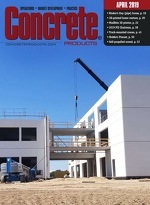 Midwest Precast provided 45 wall panels from its Mt. Pleasant, Iowa, plant, which is about 160 miles from the project site. Wall panels varied in thickness from 8, 10 and 12 inches. The largest precast wall panels were 21 ft. 3 in. x 10 ft. The precast hollow core roof panels were supplied by Circle Pines, Minn.-based Molin Concrete Products. The roof comprises 180 8-in. thick hollow core planks with the largest pieces measuring 4 x 10 feet. Additional 3-in. concrete topping was placed over the FEMA-rated shelter space. The Giovannetti Community Shelter opened in September 2013 under budget of the original design. The pre-safe room budget was around $850,000. Final budget with safe room was $1,877,000 but with $1,032,213 in federal money, the project was completed at $844,787—a win-win for everyone involved. During severe weather the Giovannetti Community Shelter’s FEMA-rated safe room can accommodate up to 600 people seeking shelter. Other amenities include a commercial kitchen, fire place, 3,000 square feet of rental space, and a 60- x 30-ft. covered patio.